The season of indulgence is upon us. But what if you could have all the rich and delicious flavors you love without the dairy, sugar, or guilt? 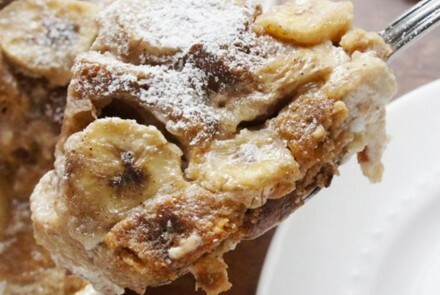 With this Healthy Bananas Foster Bread Pudding recipe, you can! Made with Schär’s new Artisan Baker 10 Grains & Seeds bread, this is a healthy spin on a sweet favorite. Lightly grease a 12” x 9” baking dish with cooking spray. Cube the bread slices into bite-sized pieces and scatter them in the prepared dish. Layer the banana slices on top of the bread cubes. In a large measuring jug, combine the coconut milk, eggs, maple syrup, vanilla, and spice blend and whisk together well until it’s all mixed and the eggs are well-beaten. Pour this mixture over top of the cubed bread and bananas, pressing all of them down slightly with a spoon or spatula to ensure all the bread is well covered. Allow to soak for 30 minutes, pressing down if needed. Meanwhile, preheat oven to 350° F.
Serve warm or cool with a sprinkling of powdered sugar, if desired.